Room in need of refurbishment The rundown state of the room and, most particularly, it’s furnishings really let down an otherwise excellent family resort. Nice hotel, rooms close to the pool! Beautiful space with well equipped room, our floor ground room opened onto the pool and bbqs which was perfect! 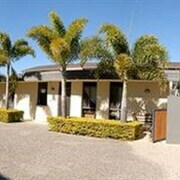 convenient and classy Quick stay passing through busy gold coast, but this hotel had all the convenience and charm of small-town holiday hotel. check in/check out couldn't be easier and great advice on local attractions. Good price, Close to the Beach and Supermarket. Not even the Hotel staff knows how to use the dishwasher though. It's so old there is no Manual on the Internet. Great apartment close to the beach. Great place, only thing it was not air conditioned, which was mentioned in the advertisement or when booking. This wasn’t really a problem as it was winter but the apartment would have been hot in summer. Otherwise it was great! Clean, friendly staff and spacious! Shop around The apartment is lacking maintainence. Vertical blinds are missing, fly screens have holes in them, taps in the bathroom were not working properly. Very uncomfortable stay. Pamphlets and local information was all out of date. It's time to ring the boss and tell them you're taking your leave. Amazing adventures are just round the corner! 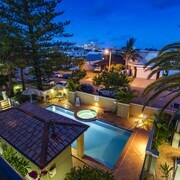 You'll find some ridiculously good-looking deals on hotels in Mermaid Beach, 4 kilometres from the heart of Gold Coast. There is no such thing as being bored in Gold Coast. Head to famous attractions like Sea World, Dreamworld and Warner Bros. Movie World and make sure you humblebrag to your mates at home afterwards. 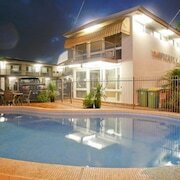 As you're hitting the streets in Mermaid Beach, don't forget to swing by the Star Gold Coast. This great sight needs to be on your travel list. 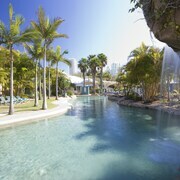 If you want to stay nearby after a day at the Star Gold Coast, the Ultra Broadbeach, Peppers Broadbeach, ULTIQA Air On Broadbeach, Aria Apartments and Q1 Resort & Spa are all recommended choices. Aim for a birdie and stay well away from the sand when you tee off at Burleigh Golf Club. If you're on the lookout for somewhere to stay close by, the Miami Beachside Holiday Apartments and Burleigh Surf Apartments are a couple of seriously sweet options. 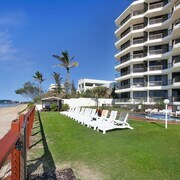 You'll have tons of fun splashing in the waves, and sprawling on the shore at Kurrawa Beach. The Peppers Soul Surfers Paradise and Hilton Surfers Paradise Residences are some of the most sought-after accommodation options to look into around here. 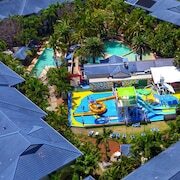 The more you save on accommodation, the more you'll have to spend on awesome Mermaid Beach experiences! The Ocean Blue Motel is among the only budget hotels here, so there's no time to waste. What are holidays for if not splashing cash? The BreakFree Diamond Beach and Beaches on Wave Street are our top picks for those who aren't scared of throwing down a little extra dosh. If you and your mates are having a hard time finding the right hotel deal in Mermaid Beach, take a look at our Nobby Beach hotels guide. 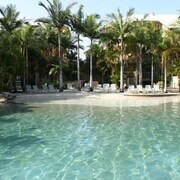 Alternatively, our lastminute.com.au Mermaid Waters hotels guide will sort you out. So, get a wriggle on! 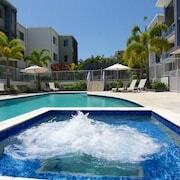 It's time to pick out your dream Mermaid Beach experiences, flights and accommodations. And remember to tag us in all of your awesome #TravelLust pics!